Wood is a living material which is why the delivered floor and pictures shown may vary. 3-layer Wideplank, 5 mm oak on top and bottom layer, and middle layer with 10 mm oak. See specifications for more details. Morello is a plank floor that impresses thanks to its attractive appearance. Morello gives you a product with unique technical properties, for which the raw materials are carefully chosen from the best quality oak trees in Europe. The Morello plank is 300 mm wide. 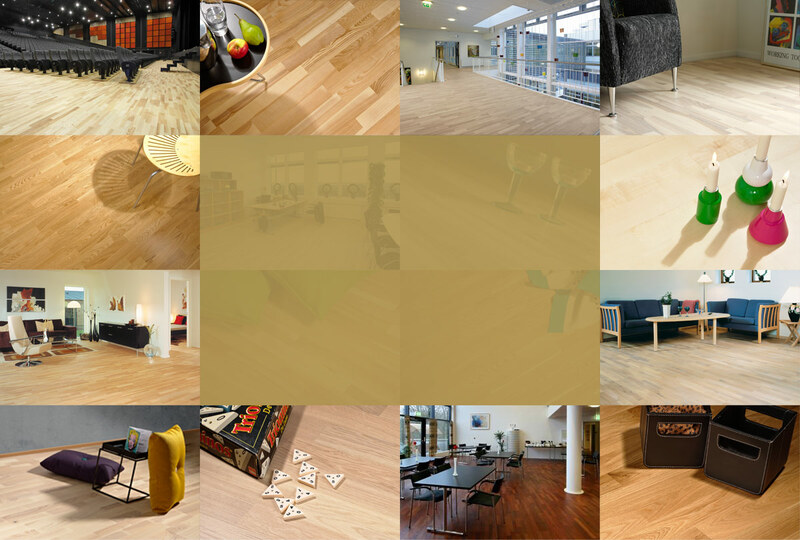 The Moland brand means years of experience coupled with high quality standards for our numerous innovative solutions within wooden- and vinyl floors and surface treatment. The product range includes glue-free installation systems (Click systems), installation on joists and floors for glueing. We are constantly on the lookout for new ways of manufacturing floors to ensure your pleasure from the first day you walk on it and for decades to come. 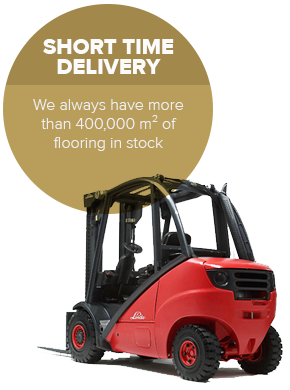 We are also known for our extremely short delivery times, high level, trustworthiness, dynamism... and for being easy to deal with. We do not believe in making things more complicated than necessary. Suitable for ship's deck floor? Download, print or save a PDF product data sheet for the floor of your choice. Top layer: 5 mm oak. In contrast to standard laminated floors, our 10 mm middle layer and 5 mm bottom layer are in the same high quality oak. The result is an extremely strong and stable construction. The Morello floor is factory-oiled to really bring out the warmth and grain of the wood. Wooden floors have become first choice for most homes. We bring nature directly into the home to reflect our own personalities. No two floors are the same! A wooden floor is a living, natural material, and choosing one for the home is often a matter of listening to your head and your heart. We associate wooden floors with warmth, cosiness, traditions, wellness, nature, a healthy indoor climate, simple maintenance and long life. Choose one of Moland's oiled floors if you want a floor in which the natural colour and structure of the wood are enhanced. An oiled floor is protected deep down in the grain of the wood. There is no surface overlay, the floor can breathe and the wood feels warm and soft. An oiled floor is easy to maintain, and if it is accidentally scratched or damaged, it can be easily repaired and protected again. A lacquered floor guarantees an attractive appearance for years to come. The lacquer provides efficient protection against general wear and tear, as it acts as a wear layer on top of the floor surface. Choose a lacquered floor if you need a really hard-wearing floor. Moland's lacquered floors have seven coats of factory-applied laquer. The grain of the wood is particularly enhanced in our brushed floors, giving it a more rustic appearance. This special surface emphasises the grain, giving it a 3D appearance. Brushed floors are given a final coating of oil to make future maintenance simple. For extra depth in the grain of the wood, a hand-planed floor is for you. You get a charming, living and sensual touch, which really emphasises your individual choice of floor. Each plank has been produced using traditional methods of craftsmanship, to give your floor a totally original and authentic look. All our hand-planed floors are given a final coating of oil to make future maintenance simple. Ship's deck floors are really something special. They simply ooze maritime charm and provide an exclusive look, but are not the sole preserve of a chosen few. Many of our floors can be combined with grey or black rubber joint seal, to give a completely unique contrast effect. We recommend that you only use oiled floors for a ship's deck floor. The seal between the planks can tolerate oil when your floor needs freshening up with a new coat of oil. Moland's vinyl floors - planks or tiles - are more popular than ever for homes, institutions, businesses etc. They fulfil all modern requirements for high functionality, comfort and an easy to clean surface. Wooden floors need loving care. 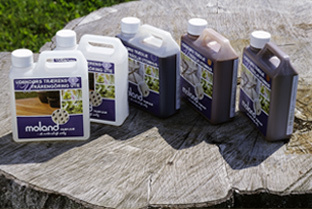 Our range of wood care products is suitable for most of the requirements you may have for treating or caring for your wooden floor. The range has been specially developed and manufactured with the environment and indoor climate in mind, and all our products have been thoroughly tested, and are supplied with detailed, understandable instructions. If you need any advice, simply contact us. We are always ready to help over the phone or via e-mail. The Select series from Moland consists of uniform boards with elegant colour shades. The floor has a calm and refined expression, with a few knots and minor fillings The Select series effortlessly provides an elegant wooden floor. Floors from the Classic series have more variation in their colour, shading, and pattern. This is reflected with moderately number and size of knots, cracks, sapwood and colour variation in the floor, which gives it a more vibrant look. There is a moderate number of fillings, dark streaks, and structure variations, which all help to give the floor a more natural appearance. This series has a trendy look and is distinguished by its variation in colour, knotting, shading, sap wood, and patterns, including fillings. The number and size of knots that can be repaired in the Trend series give it a natural expression. In addition, the filled cracks give the floor a vibrant look. The natural colour and texture of the wood is clearly expressed in floors from this series and help to highlight the wood’s unique beauty. The Living series from Moland differs from the other series because of its considerable variations in colour, knotting, sapwood, fillings, shade, and pattern. There is considerable knotting in various sizes, which can be repaired, as well as a good number of repaired cracks that vary in size. This gives the floor a dynamic look in which the characteristics of the wood are clearly visible and all add to the rustic feel of the floor. The Design series is Moland’s vinyl cork flooring, available in planks. We place great importance on preserving the natural look of wood in our vinyl floors and ensuring that they come as close as possible to the real thing. By choosing a Moland vinyl floor, you will be adding to your room’s visual beauty. Be inspired in the gallery or find your new floor. Option for ship's deck groove? Unfortunately, none of our products match your search. Contact us if you need help. It may be out of production or be replaced by another product. On the other hand, we have a huge variety of other products that we hope will fulfill your wishes. We apologize for any inconvenience .